So what is a resolution? It is something you resolve to do. Keep in touch with friends across distances. Travel as much as possible! Become fluent in 2 languages other than English. Make time to read books for fun. Try writing out your own list using this model. Once you’re nice and proud of your resolutions for the year, share them with your friends. The more people you tell, the more you will be reminded to stick to and accomplish your goals! I’m going to… (exercise everyday). Each resolution can be as detailed or as simple as you wish. However, don’t overwhelm yourself with too many complicated resolutions! 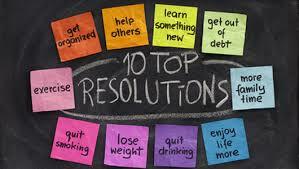 Stick with a few strong resolutions that you can really focus on and accomplish over the year. Wishing you a great start to your 2015! Outlines are like the Skeleton of your Essay! For me, outlining is one of the most underrated steps in writing. An outline is like a skeleton of your essay. 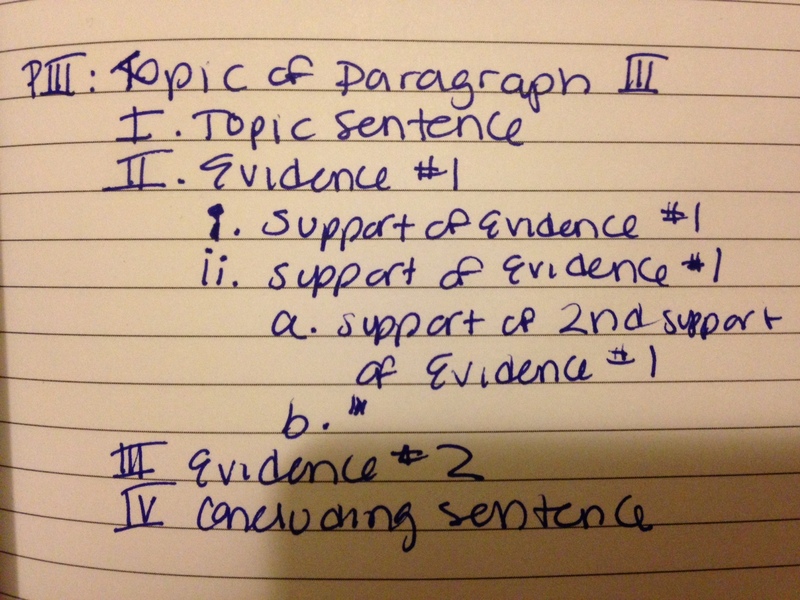 Before you go to write full sentences, you can plan the general ideas and what evidence you will use in each paragraph. Then when you sit down to write your first draft, all you will need to do is fill in the extra words that connect your thoughts and make your essay more fluent than a list. In high school, I NEVER made outlines and I was ok. Then, I got to university and did terribly on my first paper. My teacher told me to go back, make an outline and pay attention to whether everything was connected to my thesis. My grades went WAY UP and I was sold as an outliner forevermore. If you are thinking any of these things right now, take a moment to reconsider. Making an outline is a great way to organize your thoughts on paper and make the actual writing process WAY easier later on. The more you write in your outline, the less you will have to write when you go to write your final draft. So, if you actually write out your thesis and topic sentences in your outline, all you have to do is plug them in and then expand on them when you write your essay. Even if you don’t do this though, just jotting down the notes you will use in each paragraph will make your thoughts come across clearer when you actually go to write out your paper. Here’s an outlined paragraph of the example we looked at of a Paragraph Sandwich in the previous post! 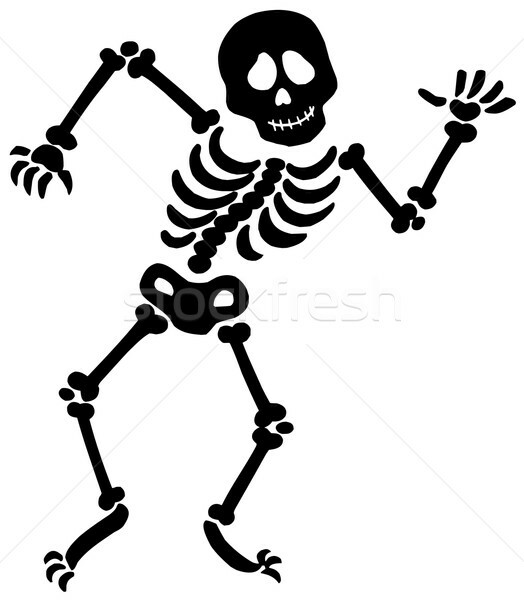 Here’s a final skeleton you can use when you go to write your paper. Just copy, plug in your information, organize and then start drafting. Happy writing! *You can have as many body paragraphs as you would like. **You can have as much support or amounts of evidence as you need. Now see a diagram of a sandwich with information about writing a paragraph! Voila! Topic Sentence (Top Bread): The mini thesis statement or main idea of your paragraph. Your topic sentence should always tie in with your main thesis of your ENTIRE essay, however this first sentence of your paragraph tells what the topic of you paragraph will be. If the paragraph is in the middle of the essay, this sentence is also good for transitioning from your ideas from the paragraph before. Supporting Details (Sandwich Insides): The ideas and examples that prove your topic sentence to be true. You can use however many supporting details as you feel necessary—just like you can add however many yummy ingredients to the inside of your sandwich. Concluding Sentence (Bottom Bread): The final sentence that ties your supporting details to your topic sentence, and ultimately your thesis statement. You couldn’t have a sandwich without the bottom slice of bread otherwise it would fall apart! Sometimes this sentence feels a bit redundant, but it shows the completion of your ideas for the paragraph and signals to your reader that you are about to start on a new path (paragraph) that will support your main thesis. 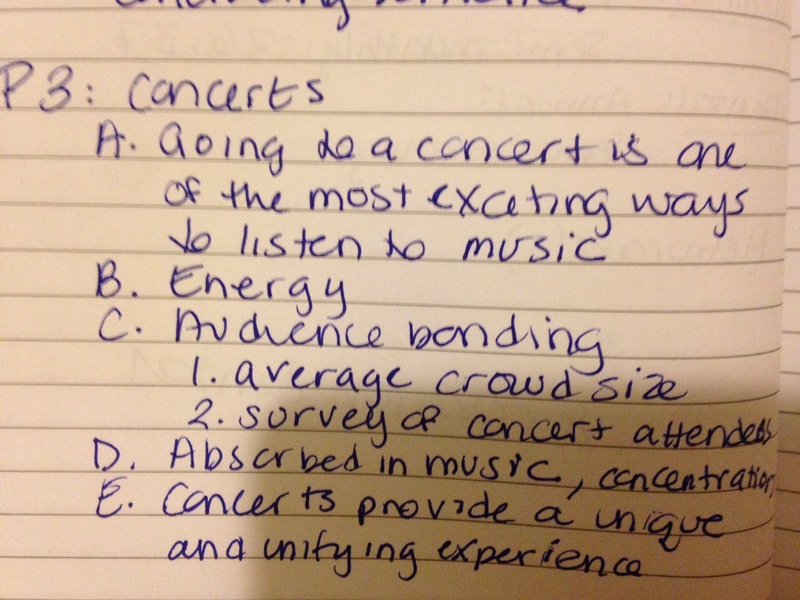 Topic Sentence: Going to a concert is one of the most exciting ways to listen to music. Supporting Detail #1: The energy of a live performance enhances the quality of the music that you ordinarily hear through a recording. Supporting Detail #2: Beyond the music, performers also often include lighting and video effects to create a larger experience for the audience. Supporting Detail #3: In addition to the performance itself, the ability to enjoy the music with other fans creates a strong bonding atmosphere in the audience. Supporting Detail #4: Therefore audience-members are absorbed into the world of the concert and can concentrate entirely on the music. Conclusion: Concerts provide a unique and unifying way to listen to music that goes beyond listening to the works of an artist in isolation. Look at this example paragraph, what might be the thesis statement for this example essay? In the 21st century, live performances are increasingly popular as a way to enjoy music within fast-paced modern society. Music is more highly appreciated and remembered when it is tied to a tangible memory. Really, this paragraph could fit into the larger puzzle of many different essays. The most important thing is that it can stand-alone as one complete thought process and most importantly, one complete sandwich 🙂 Are you hungry yet? So What is a Thesis Statement? Organize all that info in a THESIS STATEMENT! Writing essays can be a pretty confusing process. First, you gather A LOT of information, and then, you have to somehow describe everything you wrote in an organized and understandable way to someone who might have no idea what you are talking about. The exciting thing is that you are an expert, but the more important thing is whether you can explain your ideas to the lesser or non-experts of the world. Whether your essay is 150 words or 15000 words, the #1 way to tie all of that awesome information together is in your THESIS STATEMENT. What does that actually mean? Your thesis is the MAIN POINT of your essay or the #1 thing that you want your reader to take away. If you had to delete everything from your essay and could only have 1 sentence, your thesis would be it. In this 1 sentence, you are telling your reader what your essay is about. This is not an easy thing to do. Sometimes you might find yourself changing your thesis statement at the last minute. Generally, you can come up with your thesis statement right at the end of the brainstorm/research stage of your essay writing process. After you gather all that information, start to think to yourself—what is this information telling me? When I put everything together, what is that MAIN POINT? 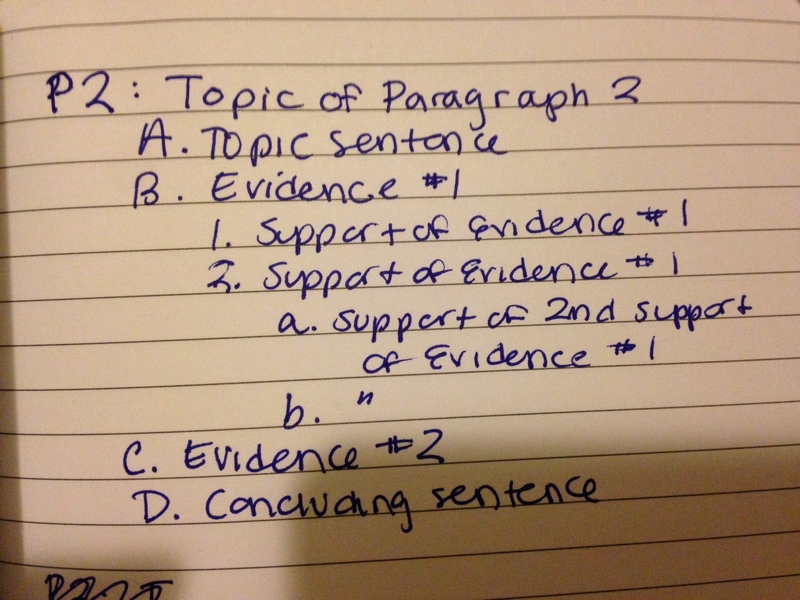 TEST: Make sure your thesis statement answers the questions of So what? How? and Why? Now that you have your awesome thesis statement, you have to put it in your essay and craft your essay around it. 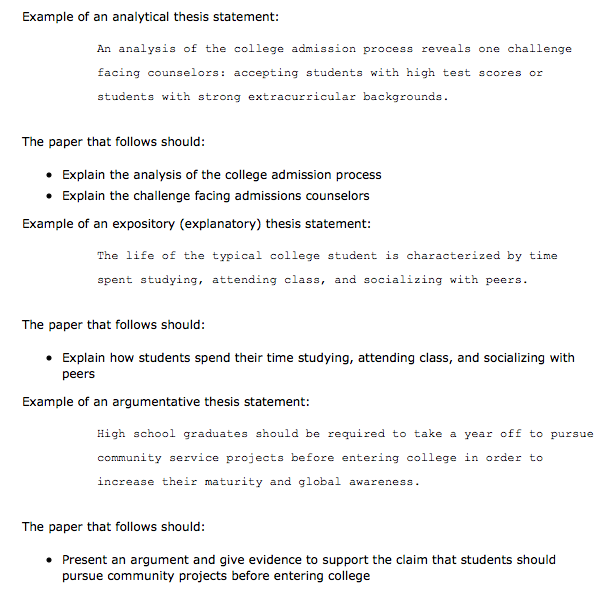 Your thesis statement usually will go right at the end of your introduction paragraph or essay section. Now, imagine your thesis is like the brain of your essay. It tells every other paragraph in the essay body what to do. Each paragraph, especially in the first or topic sentence, should relate back and support your thesis. Maybe, you have one paragraph that introduces some opposing thoughts or counterarguments, but overall, everything in the rest of your essay should be connected and tie in with what you say in your thesis. Here is an example of an outline for an essay topic asking: What is the best pet for living in a city? THESIS: Due to the small living quarters and lack of nature that are typical of urban living, cats are the best pet option for city-dwellers because of their adaptability to this type of environment. Topic Sentence: The temperament of average domesticated cats allows them to remain content within an urban environment. Topic Sentence: In addition to the compatibility of cats with an urban environment, their lifestyle also fits perfectly with that of a typically busy city-dweller. Topic Sentence: Although pet-owners are usually facing a tight budget, cats are relatively low-cost pets that are affordable in an urban environment. 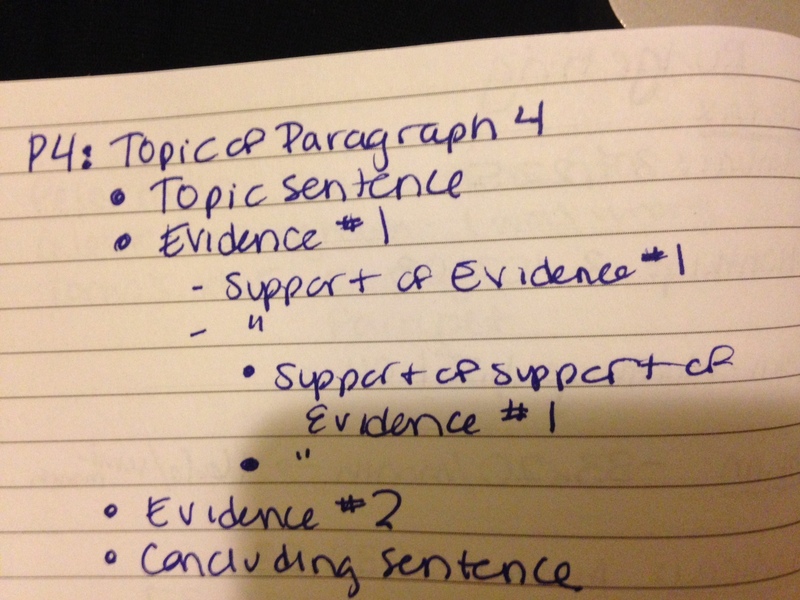 Each topic sentence relates back and supports that spectacular thesis statement. Feel free to use words and phrases again to signal to your reader that in each paragraph you are still supporting your thesis. Also, remember to tie your thoughts together using your awesome transition vocabulary! Ready to write your own? If you’re still nervous, fill out our get started form and we’ll help you write that perfect essay! 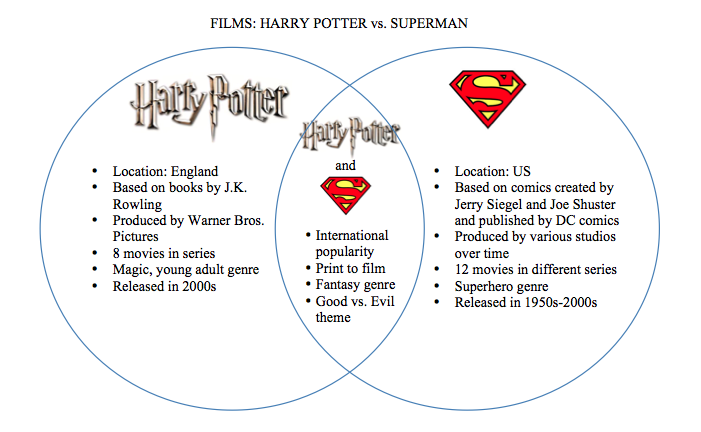 When you are assigned this type of essay, your best friend for brainstorming is something called the Venn Diagram. 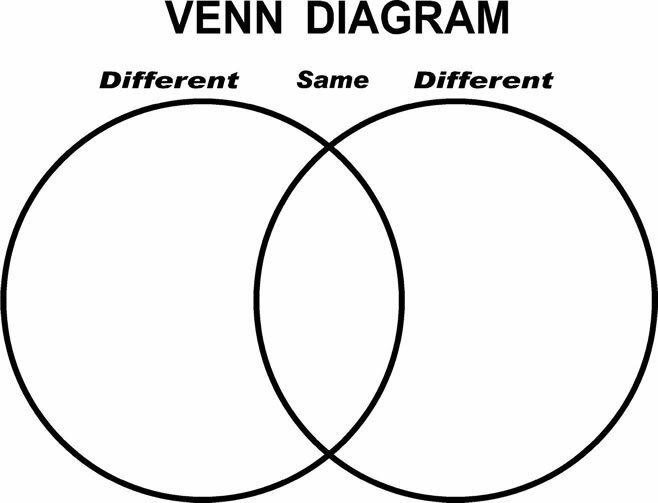 You can make a VENN DIAGRAM for any number of things to compare or contrast. All you must do are draw overlapping circles– one circle for each item that you are asked to compare/contrast. Label each circle with one item. In the outer parts of the circle, write the things that are unique to that item (the differences). In the overlapping part, write the things that are similarities. P3: DIFFERENCES Item B (Superman circles), drawing connections to what you mentioned in P2. P5: Conclusion– reinforce your ***thesis*** are there more similarities or differences? Which essay outline you choose will have mainly to do with whether you have more similarities or differences between the items. Choose whichever feels right based on your brainstorm research and information. Welcome to the ESL Write Away LLC blog! Have a question about writing? Submit it on our Contact page and we’ll write about it here. Looking for general tips or strategies for any aspect of writing? Look no further! Just need some helpful tools? Check out our Resources page!